I've really been bitten by the scrapbook bug lately, and here are a few pages I've done recently. Maybe it's knowing the baby is coming and that I still have so many pictures from Liam's three years to complete. Maybe it's finding 52Sketches52Weeks.com (possibly my favorite scrapping site ever), but I am in a scrapping groove. 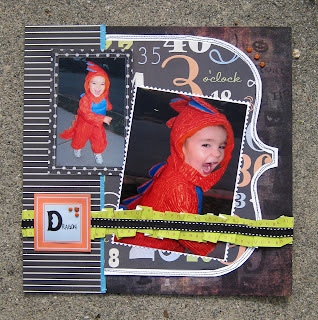 I find it fits my scrapping style to start with the layout and then find the pictures I have to match it. Took me long enough to realize that, but it has sure saved me time and frustration since I did. Also, I find I have to change it up in little ways or else I get bored. So I'm trying to include some new technique on every page I finish, to break from my dated scrapbook paradigm. On the dragon page, I folded a strip of green paper kind of screw-ompus and ruffly, and then stitched it to the page. On the other two pages I stapled the ribbons to the page, and also embroidered over some of the existing paper patterns with a contrasting thread. Also, I find that I make more time for scrapbooking if I do it with a friend. How about you? 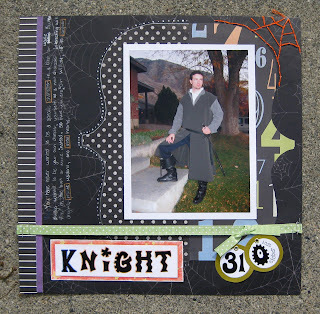 What is your scrapbook/crafting personality? Do you work best when working with others? Do you prefer to work alone? What motivates you? They look great Tabi! 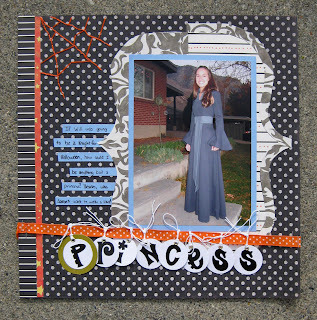 I love what you did with your page and the Princess letters! Looks great! Keep it up, even if it comes kind of slowly!